If you have not noticed by now I try to come up with different meal ideas from one main meal and transform it into multiple different meals. I had recently done this with the Spinach-Artichoke Dip and now I am doing it with the Mushroom-Pepper Ragout that I served with my creamy Italian Herbed Polenta. I first made the Italian Herbed Polenta with Mushroom-Pepper Ragout. Then I made a lasagna with the Mushroom-Pepper Ragout and the Alfredo Sauce. Now today I decided to make a Polenta Pizza Bake using the remaining Mushroom-Pepper Ragout, Polenta and some Marinara. This Polenta Pizza Bake would be great served with a garden side salad. Grease baking dish. Spoon remaining Italian Herbed Polenta into an 8×8 baking dish. Bake for about 30 minutes, until polenta is firm. Spread Mushroom-Pepper Ragout on top of Polenta. Pour marinara sauce onto mushroom mixture. 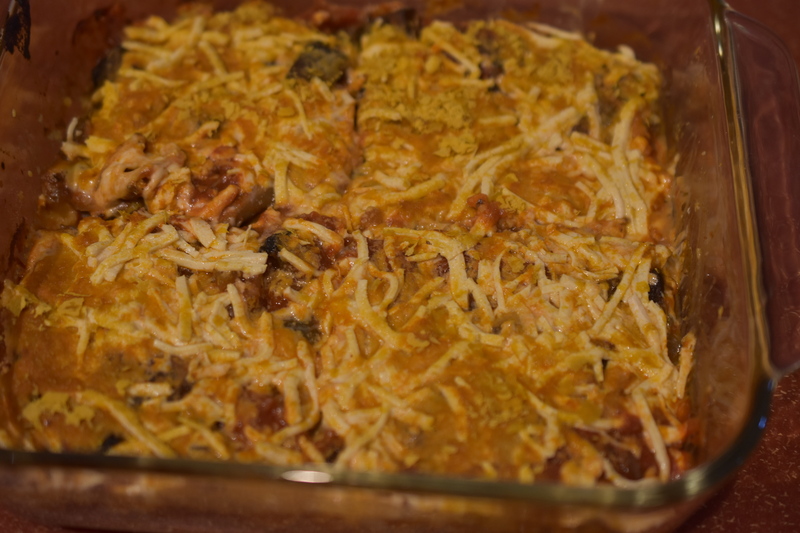 Top with nutritional yeast flakes and vegan cheese shreds.